The Angriest: Doctor Who: "The Survivors"
The Doctor, Ian and Susan continue their search for Barbara, only to be ambushed by the mysterious city's residents: mechanical robot-like creatures known as Daleks. After being taken prisoner, the Doctor surmises the reason that they are all feeling sick: they are suffering from radiation poisoning. With the Daleks' permission, Susan is sent back into the stone forest to retrieve medication from the TARDIS before it is too late. 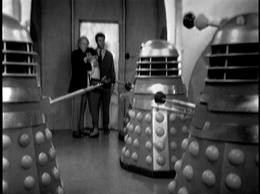 Apart from a brief cameo by a single sucker arm in the previous week's cliffhanger, this episode features the first appearance in Doctor Who by the Daleks. They completely changed the series, became a national phenomenon over the following two years and even today are arguably more famous than the television series they came from. Once you get over the immensity of the moment, however, it turns out that the Daleks are a bit of a surprise. Here's the thing: we're used to the Daleks as a race of rantic, bigoted, genocidal maniac blobs hiding inside armoured battle suits. In their first appearance, however, they're not remotely like that. They don't even say "exterminate" for another two episodes. Here they are deeply creepy. They glide quietly through their home city. While they do rant a bit at our regular cast in those iconic mechanical voices, they are also seen to have lengthy conversations with one another. A faulty assumption developed by the mid-1970s that Daleks couldn't sustain dialogue with one another, which is why we got Davros ranting on their behalf for every Dalek story from "Genesis of the Daleks" onwards. This episode puts paid to that myth, and it's the first time the Daleks were ever used. Now I'm not going to claim that this is the best that the Daleks ever were, and that it all goes downhill from here, but it is true that there is an unsettling quality to them in this episode that the series never quite manages to recapture. They're not arch-enemies here - not yet - and instead they're simply a unknown and brilliantly weird menace. Susan has a bit of a panic attack when tasked with going back into the forest on her own. On one level it's understandable: last episode she was almost accosted by a stranger in that jungle. On the other hand it's another step in the progressive weakening of Susan as a character. In "An Unearthly Child" she was impossibly smart and remarkably bold. Here she's now just a screaming victim, and her character arc sadly won't get much better hereon in. This serial was adapted into a feature film in 1964, with Roberta Tovey playing a much younger iteration of the character and surprisingly a much pluckier and likeable one at that. It's a difference in character that makes Tovey's Susan one of my favourite companions of all time, and Carole Ann Ford's (through no fault of her own) one of my least favourite. Overall this episode is the most like a Saturday morning movie serial that we've seen so far: the characters get out of one scrape and fall into another. It is, all up, wonderfully entertaining children's television, and certainly the Daleks still hold up today. They're just marvellous. No wonder British audiences went nuts for them. After this episode aired, the series' viewing figures in the UK jumped up by almost 50%. Six episodes in, and Season 1 has enjoyed five good episodes. That gives it a score of 83%. We're watching this series with our kids at the moment-- our 9 year odl received a box set of the first 3 serials for his birthday-- and his ongoing complaint is "Why doesn't she just take a breath and stop *panicking* all the time?" Ford's hypermanic and toneless performance aside, she really is a massively irritating character. Susan can be very irritating, but she does have her moments. Her gambit to get the escapees into the lift after they get out of the cell, and her grin and wink after she's tricked the Dalek are a fine example of what I wish the character had been like more often. I like Susan, but I find the character full of sadly unrealized potential. I think Carole Ann Ford felt the same way. Sorry, the incident I mention is in episode four, so maybe I should have saved my comment until then! I love this story. It's the only time the Daleks were ever portrayed as aliens beings, as opposed to bad guy monsters. Also love their appearance in this episode, the Daleks never seemed as alive again, with all their little movements and twitches.